Typical 23 rd -century personal communications device. Features flip-up antenna grid and multi-band tuning. Such equipment was developed by many races. The skill added by a personnel with this Equipment card is retained only while that personnel is present with the communicator and the personnel from whom the skill was added remains at the same location, or until you re-select the skill. See skills &ndash; modifying. Because this card is not cumulative, you may not use two copies to add two skills to the same personnel, but you may use two copies to add a skill (the same or different) to two different personnel (even in the same crew or Away Team). 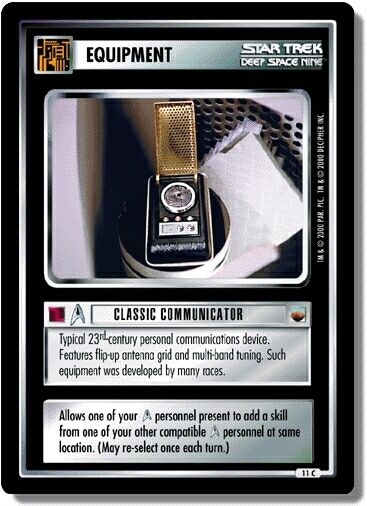 There are 19 entries for Classic Communicator (ST1E 9 C 11) at the Tradeplace (73 haves and 0 wants). Click here to see all trade list entries for this Common card!